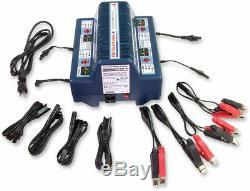 OptiMate PRO-4 Professional 4-bank 12V battery charger TS-53. The original equipment manufacturers (OEM) recommended 4-bank battery care center for correct activation of NEW batteries as well as recovery, charge and testing of neglected sulphated / low-voltage batteries. This unit is perfect for a dealership, shop or a private owner of a collection of vehicles. NOT compatible with Lithium type batteries. NEW mode 1 hour activation charge only for new batteries that have received acid just prior to charging, such as STD flooded batteries with removable filler caps and AGM-MF dry-charged batteries that are delivered with a separate custom acid pack. 2A / 4A mode 12 hour max. Charge mode for diagnoses, recovery, charging, testing of low volt sulphated batteries. Suitable for recharge of all batteries including factory activated sealed AGM batteries e.
Yuasa YTZ, GYZ prior to sale. Includes wall poster with instructions to prepare and charge batteries. BANKS / CHARGING STATIONS : 4 (each bank operates independently). CHARGING AMPS (per bank) : 4A maximum, Ampmatic control. USE : Indoor / workshop environment (lowest temperature: -4°F / -20°C). SAVE : Low Volt Start of 1.8V + 2 step desulphation recovery. 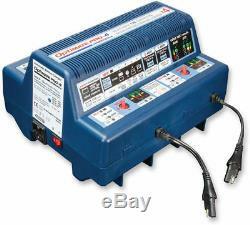 IDEAL FOR : STD, AGM & GEL 12V batteries from 2 40Ah. INPUT : Selectable 110-120VAC / 220-240VAC 50-60Hz, with ON/OFF power switch and replaceable fuse protection. STYLE : Vented industrial table top case with wall mount option (TS-218), 6ft / 180cm AC supply lead and 4 x 6ft / 180cm charge lead ending in SAE connector. 4 x standard battery clip sets included. SAFE: No risk of overcharging. Safe for long-term battery maintenance. Automatic shut-down if short-circuited or battery disconnected. Is a premium brand founded in 1994 in Belgium, to continue the development and manufacturing of professional equipment. This includes battery charging, battery testing, engine troubleshooting and tuning tools. These products are developed specifically for the power sport, marine, automotive, light aircraft and industrial equipment industries. Products of TechMate include: OptiMate, BatteryMate, AccuMate, TestMate, CarbMate, SynchroMate & IgnitionMate. This is to ensure your package gets to you as quickly and as well packaged as possible. Our inventory is constantly updating and changing, we do our best to keep it as accurate as possible. However, in some instances seasonal items sell very fast and can be subject to temporary delays. In the event of a prolonged delay we will make our best effort to contact and notify you of such delays. We will do our best to work with you to get you your item as fast as possible. Electrical parts are NOT returnable. The item "TecMate OptiMate PRO-4 Professional 4-bank 12V battery charger TS-53" is in sale since Monday, April 9, 2018. This item is in the category "eBay Motors\Parts & Accessories\Motorcycle Parts\Electrical & Ignition\Other Electrical & Ignition". The seller is "ocp-parts-warehouse" and is located in Toms River, New Jersey. This item can be shipped to United States, Canada, United Kingdom, Denmark, Romania, Slovakia, Bulgaria, Czech republic, Finland, Hungary, Latvia, Lithuania, Malta, Estonia, Australia, Greece, Portugal, Cyprus, Slovenia, Japan, Sweden, South Korea, Indonesia, Taiwan, South africa, Thailand, Belgium, France, Hong Kong, Ireland, Netherlands, Poland, Spain, Italy, Germany, Austria, Bahamas, Israel, Mexico, New Zealand, Singapore, Switzerland, Norway, Saudi arabia, Ukraine, United arab emirates, Qatar, Kuwait, Bahrain, Croatia, Malaysia, Brazil, Chile, Colombia, Costa rica, Panama, Trinidad and tobago, Guatemala, Honduras, Jamaica, Viet nam, China, Barbados, Bangladesh, Bermuda, Brunei darussalam, Ecuador, Egypt, Gibraltar, Guadeloupe, Iceland, Jordan, Cayman islands, Sri lanka, Luxembourg, Macao, Martinique, Maldives, Nicaragua, Oman, Peru, Pakistan, Paraguay, Reunion.